The 63rd FIAF Congress Tokyo 2007 Symposium "Searching the Traces: Study of Short-lived Film Formats"
Under the theme of "Searching the Traces: Study of Short-lived Film Formats", the Symposium offered a wide range of papers as well as presentations on the many short-lived formats for film and other visual medium prior to the establishment of 35mm film as the norm of the industry. At the same time, the presentations stressed the need for the preservation and restoration of not only such short-lived film formats of the past, but also of its projection equipment as well. We are listing a brief description of only a portion of the presentations and images presented at the Symposium. Should there be any further interest in these subjects, please contact the presenters directly. As most of the presenters are F.I.A.F. related, their contact information is available on the FIAF website. 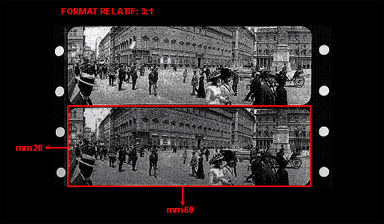 Prior to the birth of cinema, there were a multitude of image formats including fixed images (magic lantern slides, anamorphoses, panoramas, dioramas, polyoramas), 3D images (perspective views and stereoscopic views) and dynamized images (mechanical magic lantern slides). 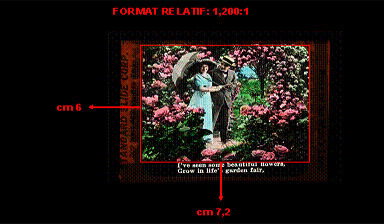 These formats all had a specific aspect ratio and some were passed on to filmmaking. Panorama magic lantern plate. Italy. Latter half of the 18th Century. 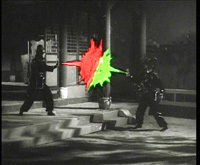 The film format providing hand colour special effects to black and white sound films in the 1960s was one of many short-lived film formats in the history of Hong Kong cinema. 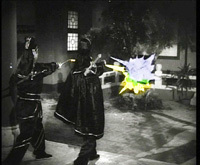 Such hand coloring provided special effects mainly to depict an air of fantasy by presenting traditional Kung Fu like martial art technique of using one's "spirit" to bring down an opponent without any physical contact. 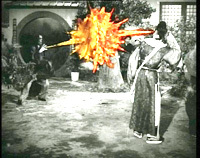 However, the hand colour film format used on black and white film started to fade and eventually was forgotten as color film became the norm in the Hong Kong film industry. The French Film Archives of CNC preserves short-lived film formats of 35mm and under, as well as their projection equipment. Included in this collection are the Lumiere 35, the Pocket Chrono Gaumont 15mm, the Pathe 17.5mm, the Planchon Mirographe 20mm, the Edison 22mm, the Ozaphane Cinelux 23mm and the Pathe Freres 28mm. 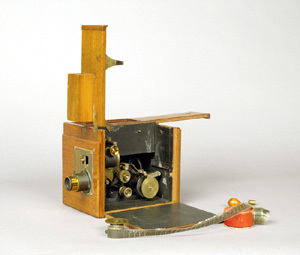 The Cinematheque Francaise preserves a 4000+ collection of archaic and modern equipment dating back to the 18th Century. 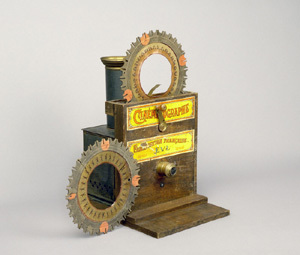 Not only does the Cinematheque Francais collect such equipment but it also preserves the images produced by such equipment. The Baby Pathe (9.5mm) and Kodak's 8mm and 16mm cameras were imported into Japan in 1923, and helped popularize filmmaking in Japan. However, because such equipment was very costly, only the well to do could afford them. Nevertheless a change came with the post-war era. 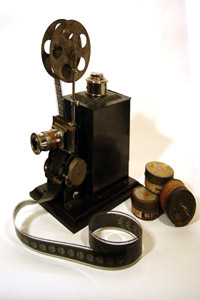 After the end of the war, prices for cameras dropped starting with the introduction of the Super 8 and Single 8, and this led to a trend of amateur filmmaking and to the creation of 8mm film festivals. In this medium, the Fukuoka City Public Library Film Archive has succeeded in the restoration of the 8mm "Little Cub Bear,"which won an award at the Cannes Short Film Festival. The Film Archive has also succeeded in restoring Japan's first post-war feature animation, "The Princess of Baghdad" jointly with the National Museum of Modern Art Tokyo-National Film Center. There was a time in Japan when people used to enjoy toy film projectors. These projectors made out of tin plates were small but could project fragmented 35mm film as well as film made especially for them. 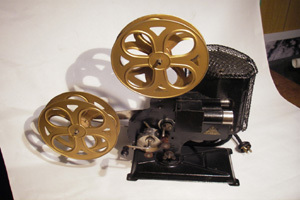 These projectors became a trend during the golden age of Japanese silent films (1920〜30) when samurai films were extremely popular.Toy film in Japan covered a wide spectrum of genre including animation, news reels as well as military propaganda films, and for this reason, play an important role as precious, historical material. 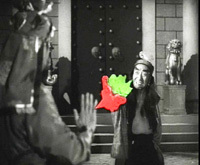 During the 1930s, projection of paper film in Japan was a popular form of entertainment.This film format came with an original method of projection. Paper film frames were printed using the off-set method.The film then would be projected once exposed to light. Major manufacturers of paper film included companies such as "Refcy" and "Kateitoki" but hardly any have survived the age of time. The National Museum of Modern Art Tokyo-National Film Center has only a limited number of paper film in its collection, but will continue in its preservation of paper film as documentation of cinematic history. Photographs: Courtesy of Natsuki Matsumoto, Taiji Kozaki from the presentation, "The Oldest Japanese Animated Film and Toy Motion Pictures". 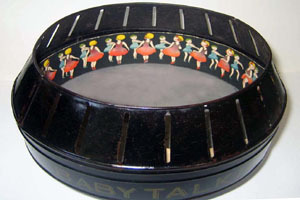 Made of steel, the "Baby Talkie" was a "picture box" where music and animation could be enjoyed together. It was set in the middle of a SP phonograph of the time making the "family talke picture" experience possible while listening to one's favorite piece of music. 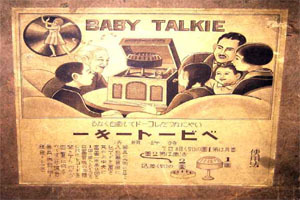 Baby Talkie material came in the form of items representing traditional Japanese culture as well western matereial such as Charlie Chaplin.